The Pioneer CDJ-2000NXS2 is the latest generation of the industry-standard, Rekordbox based DJ multiplayer CDJ range. With a feature set including performance-enhancing controls, improved audio quality and support for new lossless audio formats this truly is the next generation of booth ready multiplayer. Offering the highest quality audio quality of any DJ Multiplayer, Pioneer's CDJ-2000NXS2 utilises a 96kHZ/24-bit soundcard to deliver a clearer, crisper sound while supporting cutting-edge lossless formats including FLAC and ALAC (Apple’s lossless audio format). The 32-bit D/A converter eliminates distortion and the separate analogue power supply reduces unwanted noise. This is the best sounding CDJ to date, given that USB storage has become so affordable many DJs are now using lossless formats to ensure that the tracks they play sound as the producer and sound engineer intended and the NXS2 ensures today's digital DJ sounds amazing. The 7-inch, high resolution touchscreen makes navigation of even the largest libraries a breeze thanks to its QWERTY keyboard search which, when combined with the all new Track Filter controls - intuitively located next to the data dial, will have you loading the track you need within seconds. This enhanced touchscreen also features multi-coloured wave display, needle countdown (touch a point in the track to see how many beats away it is from the current playback point) and offers great visibility from almost any angle even when used outside. Beat Sync, Slip Mode and Auto Cue Load have remained popular since they were introduced and the CDJ-2000NXS2 now offers even greater performance features including 8 colour-coded hot cues, which can be configured using Rekordbox or edited on the fly using the new simplified workflow. The 2000NXS2 also allows connection of additional MIDI controllers, such as the DDJ-XP1, which can be used to trigger additional loops and hot cues with up to 4 CDJ-2000NXS2 using Pro DJ Link. You can also use fractional beat quantisation for greater precision and versatility. Pioneer have also added a three position lever for Slip Reverse, Forward and Reverse. Pro DJ Link allows up to four CDJ-2000NXS2 to share one source for playback, but this often under used feature now offers even more including improved beat grids, which are now accurate to the microsecond, as well as a quantized beat jump and a detailed Phase Meter. The Pioneer CDJ-2000NXS can now also make use of additional Rekordbox data including colour coded memory cues, multi-coloured USB port light (displaying a colour you have set in Rekordbox for that particular USB key/drive) and thanks to the enhanced screen can also display other info for tracks that have been analysed – such as key for example. The latest CDJ also supports rekordbox DJ HID control, this will become available at a later date through an add on. The unit will also auto standby and features a hard wearing, high quality, anti scratch aluminium top plate ensuring the product is ready for the rigours of professional use. 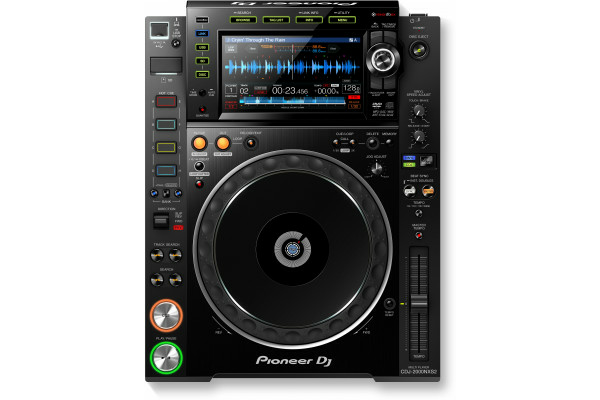 Seen the Pioneer CDJ-2000NXS2 Professional DJ Multiplayer from another UK Dealer Cheaper?